My name is Kent Muramoto and I’m an air conditioning professional on the Leeward side of Oahu. Today I’d like to share with you 5 Secrets about air conditioners and your home that can help you improve your home life. Lately the weather in Honolulu has been cool and wet with no signs of letting up. Trade winds come and go but as summer is near the weather will be much more uncertain with hurricane season upon us. I’m hoping these secrets will help you improve your life at home for you and your family. Secret #1: A comfortable stable temperature in the house is good for your health. I am not a doctor but I think this makes sense. When the temperature in your house fluctuates too much, your body needs to adjust and this constant change can use your body energy unnecessarily which might affect your health. It’s best to have your air conditioner on low energy mode to keep a constant temperature. This saves electricity and helps your body too. Did you know that the size of your air conditioner is very important for your health and to save electricity? If your air conditioning system is not planned correctly, you could be losing valuable electricity with wastage and that might lead to an uncomfortable feeling in your house. Over time this could lead to health issues. Size is not the only thing that matters with your air conditioner. Location also matters. Your air conditioner needs to have an unimpeded airflow and should not be in direct sunlight because this will affect the thermometer which regulates the temperature of the airflow. This could lead to electricity wastage as well as it might have long-term negative health effects. Freon is a special substance used in cooling for most air conditioning systems. It lasts for a very long time. If your air conditioner seems to be in need of repair, the issue might not be with freon. If you would like more information about this, please contact me below..
Hawaii weather can be very volatile. During hurricane season please make sure your air conditioner is working properly. In storm weather the temperature can fluctuate quite a bit and high winds may affect your outside fan unit if you are using a split system. When winds are very strong, please check outside regularly to make sure your fan is working properly, and the airflow that comes out of the inside unit is clear. Sometimes debris might block the intake of your outside fan which could harm your air conditioning unit. This quick inspection will take just a few minutes but it could save the life of your air conditioner. I hope this helped you learn more about how your air conditioner can improve your family’s life. 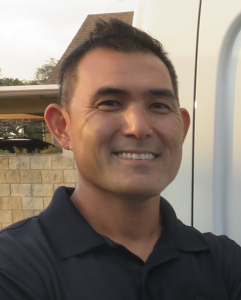 Kent Muramoto is an air conditioning professional with hundreds of installs and repairs under his belt. He is an authorized Mitsubishi partner and can get you some of the best prices on the island. His company, KK Air Conditioning, is based out of Mililani, Hawaii and he services all parts of Oahu.